Yesterday, following the lazy-weekend mode..... 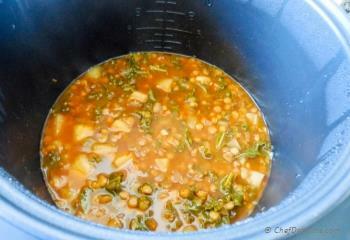 I decided to dust my slow-cooker and put it to work for me.... and made this delicious, one-pot, lentil's soup. 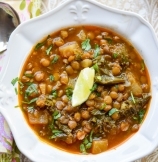 There are two special ingredients in this lentil soup, Turnip and Kale! You all know my love for kale. I love turnip too! but Vishal don't ..... so I often add it to curries, stews, and what not! :) about me? I will eat a bowl of raw or roasted turnips with raw tomatoes and radish, and just a sprinkle of salt and pepper, for lunch, any day! That slight sweet and sharp notes of turnip with salt, makes it so mouthwatering!! given a choice between turnip and potato, I would rather pick a turnip, but no one else would, in my home... so I add it to soups/stews for added nutrition and low-calories. 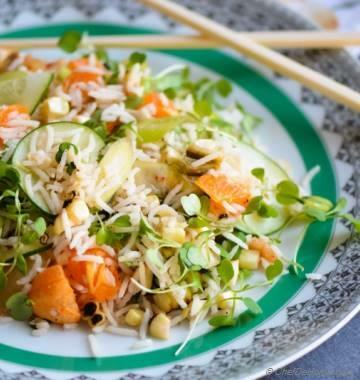 If you don't like turnip, you can use carrots or baby potatoes, or any root vegetable of your choice. 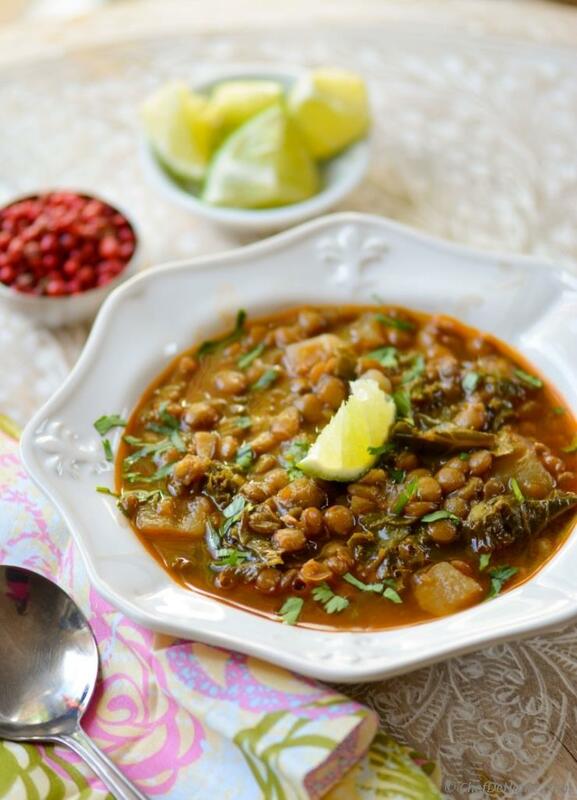 This soup is one bowl of nutrition! 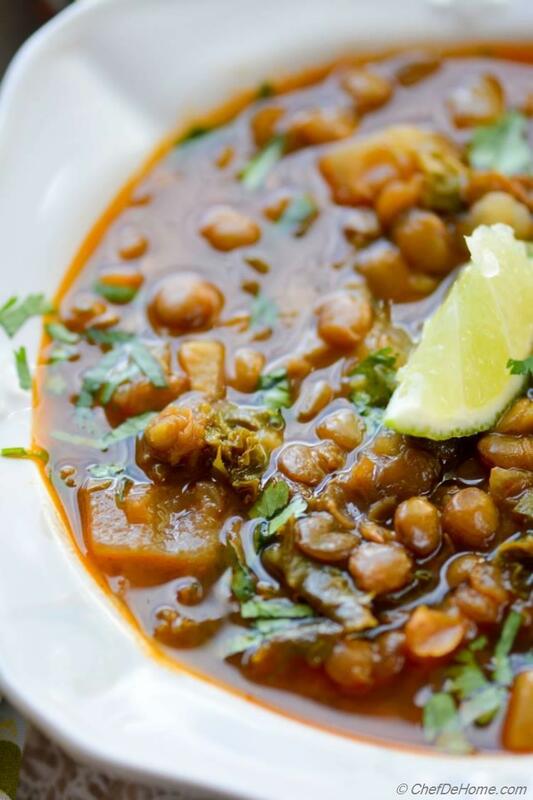 Other than being packed with curry flavor, this lentil soup is low in sugar, low in fat, is vegan, is gluten free, has good serving of lentil protein, calcium, folates, and potassium. How good does that sound? Did you know? Turnip, as root vegetable, in place of equal amount of potato, has very low saturated fats. So it is good for you! 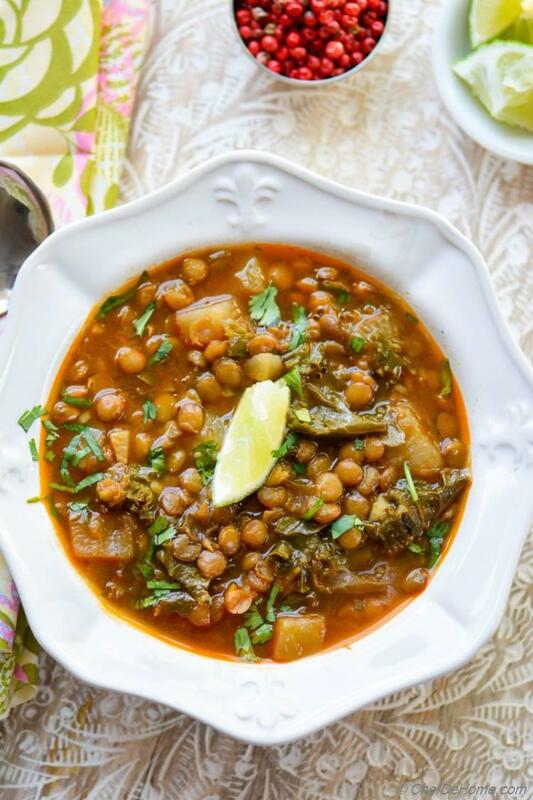 Switch on your slow cooker, and enjoy a bowl of this slow cooked low-calorie, vegan, and gluten free lentil soup packed with nutrition of kale and turnip!!! A crusty bread is "The best" companion for a this soup! Smart Swap Can't find Kale? 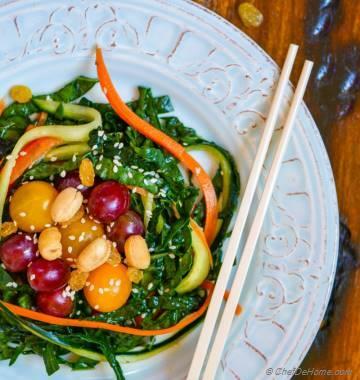 Use spinach or swiss chard or mustard greens. 1. 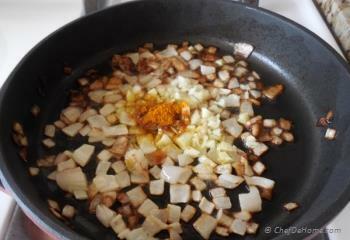 Heat oil in a small saute pan, then add onion and saute until brown on edges. 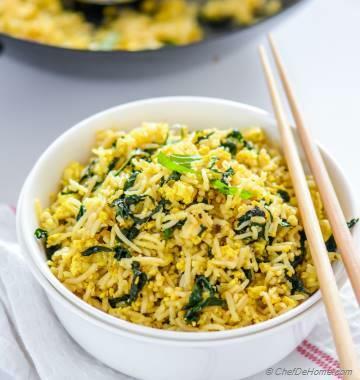 Add garlic and curry powder and cook for 30 seconds. 2. Transfer chopped kale, onions-garlic mix, tomato paste, water, lentils(washed), turnip, with 1/2 teaspoon salt into the slow cooker pot. 3. 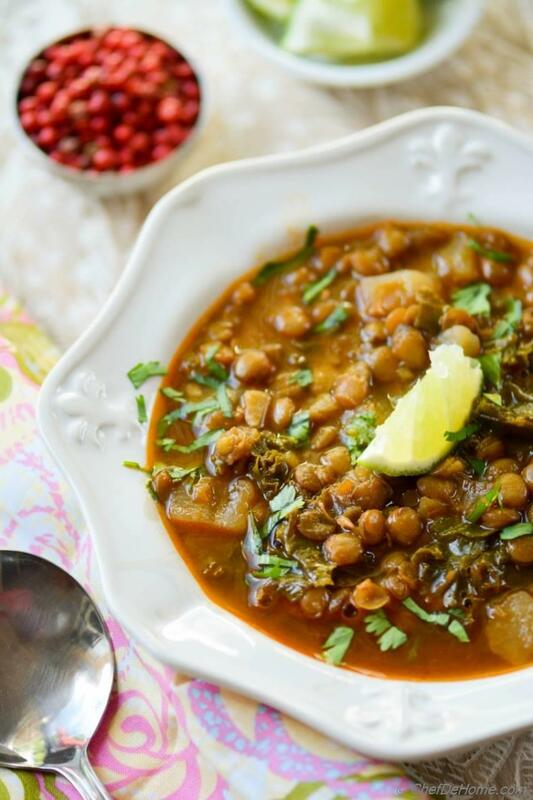 Place the lid of slow cooker and cook on high for 1 hour and 45 minutes or on low for 5 hours, make sure lentils are fully cooked. 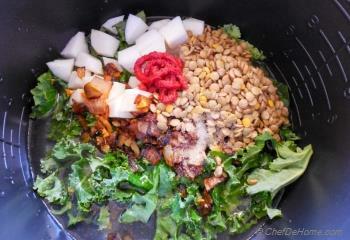 For thicker soup, puree 1/2 cup lentil soup in food processor, then return back to soup and mix well. 4. Add lime juice. Alos, taste and adjust salt and black pepper. Serve hot with bread of your choice! To cook same soup in pressure cooker: Follow step 1, then transfer everything in pressure cooker pot instead of slow cooker. Place the lid. Bring to full pressure on high heat, then lower the heat, and cook for 8 minutes, or if your pressure cooker has whistle indicator, then cook for 6-7 whistles on low-medium heat. Calories Info: Total Calories: 254. 127 per serving of 2 cups of soup. 63 calories per serving of 1 cup with a side (additional cals). This soup is really delicious! My kids loved the turnips. Who knew? Now this time around, my turnips arent quite ready to be picked yet, but I have over-grown radishes. Do you think I could sub them? I'm glad your family enjoyed soup. Actually, radish will be a good substitute in this soup. It will not taste same as turnip, will be somewhat mild turnip + potato flavor. If your family enjoyed turnip, radish stands full chance. Let me know how it goes. Happy cooking. It is delicious. When did you add the lime? I don't see that in the instructions. Thanks. thanks, Trish! Also, thanks for bringing this to my notice. I add lime/lemon juice after cooking when just adjusting seasonings. I also updated steps. I hope you like the soup if you get chance to try it. 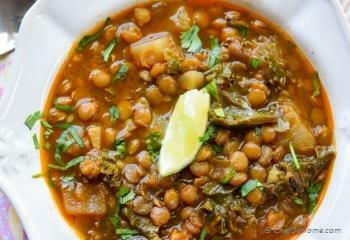 Hi Savita I love lentil soup and the flavours that you put together, they go well.Thank you. thanks, Anupama! This bowl of soup was indeed comforting! perfect for winter dinner! right? That looks so comforting Savita, pass me a bowl please!